As the United States and Russia teeter toward a new Cold War, it is paramount to reflect on the lessons of the old one. The danger of accidental war in a world bristling with nuclear weapons was one of the factors that made the old Cold War so perilous. Over a series of cold November nights in 1983, that danger was higher than at any time since the Cuban missile crisis—and the Reagan administration didn’t have a clue. The British historian and filmmaker Taylor Downing’s new book, 1983: The World at the Brink, is the most readable version to date of an episode that holds lessons for today. During the nadir of Soviet-American relations in the early 1980s, the Reagan administration’s tough foreign policy and massive military buildup convinced the Soviet leadership that Washington might be preparing a preemptive nuclear strike against Moscow. Throughout 1983, an extraordinary succession of events ratcheted up the tension. In early November, NATO began an annual war game, Able Archer, designed to simulate a nuclear attack on Warsaw Pact targets. The Soviet response was unprecedented. Nuclear-capable bombers and Soviet fighter groups in East Germany and Czechoslovakia were placed on unusual levels of alert. All non-reconnaissance flights over Warsaw Pact territory were grounded. Soviet nuclear submarines raced for the protective cover of the Arctic ice. Western leaders were largely unaware of Moscow’s reaction at the time and divided over its meaning after the fact. The CIA insisted the Soviets had been merely “rattling the pots and pans” to galvanize public opinion against the planned deployment of American Pershing II intermediate-range missiles in Western Europe. Yet Margaret Thatcher’s government, which was receiving information from a KGB double agent at the Soviet Embassy in London, urgently warned Washington of the danger. Diplomatic eminence George Kennan described the mood in 1983 as having “the unfailing characteristics of a march toward war.” As former secretary of defense Robert Gates admitted, the world may have been on the brink of nuclear war and not even known it. After years of debate in the intelligence community, a highly classified review of all materials held by US intelligence agencies, commissioned in 1990 by President George H.W. Bush’s Foreign Intelligence Advisory Board, concluded the same thing. Downing first came across a few fleeting references to Able Archer while working with the producers Jeremy Isaacs and Pat Mitchell on the acclaimed CNN Cold War TV series in 1998. Cold War went on to win a prestigious Peabody Award, but Downing couldn’t put the Able Archer crisis out of his mind. “The whole story stuck with me, partly because it just seemed extraordinary that the Soviets could have misinterpreted the situation and actually believed they would come under attack, and partly because no one in the West picked up on this,” he says. But without more evidence, Downing was in limbo. Then President Bill Clinton left the White House. “It happens with every outgoing administration,” says Downing. “A trove of documents was declassified and released.” Among them was a report by CIA historian Benjamin B. Fischer that offered the best outline of the crisis to date. Taylor tracked Fischer down in Washington. “It was very lucky because he had just retired from the CIA and felt he could talk a little bit,” Downing recalls. “He could at least tell me the story.” With Fischer’s insights, Downing thought he might have enough material for a television documentary. He persuaded the Discovery Channel in the US and Channel 4 in the UK to fund the project. The next step should have been to sign on an historian to provide the expertise. But Downing couldn’t find anyone. “Everybody said to us, without exception, ‘If you find out what happened come back and tell us, because we don’t really know what went on in November 1983.’” Unfazed, Downing and the crew of his production company, Flashback Television, tracked down and interviewed as many participants in the crisis as they could find, from Moscow to London to Washington. The resulting documentary, Soviet War Scare, 1983, aired in the United States in late 2007 and a short time later in the UK as 1983: Brink of Apocalypse. At the 2008 Grierson Awards, the UK’s top awards for documentary film making, the film won the award for Best Historical Documentary. Yet the program had to rely on some major assumptions to fill the gaps left by a lack of documentary evidence. Help eventually came from American researcher Nate Jones, director of the Freedom of Information Act Project at the National Security Archive in Washington, DC. Jones has overseen a relentless campaign to pry classified material on Able Archer from the US government and publish it online. Anyone wanting to know about Able Archer now has a place to go and browse. The Holy Grail, however, was that secret 1990 report by the President’s Foreign Intelligence Advisory Board. When Jones secured its declassification and release in the autumn of 2015, it confirmed what Downing had already suspected. “It absolutely vindicated that where we had 2 and 2 and guessed that it made 4, we can definitely establish now that 4 was the right number,” Downing says. The war scare was real. In the Kremlin, Soviet leader Yuri Andropov had become convinced that the United States was preparing to launch a nuclear first strike against the Soviet Union. In 1981, as head of the KGB, he had initiated one of the largest intelligence-gathering operations in history. Operation RYAN (a Russian acronym for Raketno-Yadernoye Napadenie, or nuclear-missile attack) ordered KGB and GRU officers worldwide to ferret out evidence of American preparations for an attack. Those officers, aware of the penalties for slacking on the job, quickly found material to pass on to Moscow. After Andropov succeeded Leonid Brezhnev in November 1982, Operation RYAN took on even greater weight. The situation festered for the first two years of the Reagan administration. 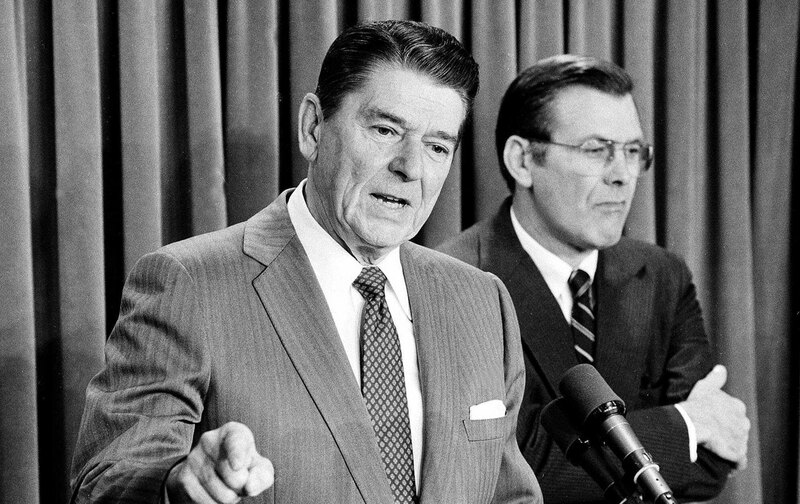 Then, on March 8, 1983, Reagan denounced the Soviet Union as an “Evil Empire.” The Soviet leadership reacted with alarm; such ideological speech was unusual for American presidents. Was Reagan warming up public opinion for war? Two weeks later, Reagan announced his Strategic Defense Initiative, dubbed “Star Wars” by the press. The Soviets were horrified. They believed SDI would render their nuclear arsenal obsolete; trying to compete with it would bankrupt the already sclerotic Soviet economy. For Moscow, SDI posed an existential threat without firing a shot. The next month, a secret naval exercise, FleetEx ’83, brought three US carrier battle groups up against the coastal waters and airspace of the Soviet Far East. US probes included a mock bombing run over a Soviet military base on the island of Zeleny. A furious Andropov gave a shoot-to-kill order on future incursions. Meeting with the American statesman Averell Harriman in June, Andropov pleaded for the United States government to step back from the brink. Weeks later, suffering from the kidney disease that would soon kill him, the Soviet general secretary disappeared from public view. Then everything started to go wrong. Downing’s book makes the most compelling case yet that the Soviet reaction to Able Archer was extraordinary. Cables coming into the London KGB residency warned that NATO forces had gone on alert and might be preparing for the long-awaited first strike, possibly beginning in seven to 10 days. KGB officers were urged to go all-out in their search for signs of preparations for war. Roughly 50 percent of the SS-20 missiles were deployed to their secret field stations. The MiG-23 fighters on East German runways were placed on 30-minute alert. After the players in the war game moved to Defense Readiness Condition (DefCon) 1, the highest level of military alert, NATO did what it had never done before, changing the codes used in every other Able Archer exercise to something totally new for the most sensitive part of the game. The eyewitnesses Downing interviewed for the 2008 documentary give striking accounts. The commander of an SS-20 unit recalls the order to stay in his command bunker in constant radio communication, on the highest state of alert, waiting for orders to launch. He was in contact with Marshal Nikolai Ogarkov, the chief of the Soviet general staff, who had descended into the bomb-proof bunker outside Moscow, from where he could launch an attack should the leadership in the Kremlin be wiped out in a decapitating first strike. An assistant commander on a Delta-class nuclear submarine describes how his sub moved to its battle station under the Arctic ice and remained in a continuous state of combat alert, the only such instance in his 18-year career. In an SS-19 ICBM silo, a two-man team was joined by the dreaded “third man,” a presumed KGB officer, assigned to ensure that any orders to launch would be followed. The deputy head of the KGB residency in London, Oleg Gordievsky, was a double agent who had been working for MI6 for a decade. He reported that the Russians were truly spooked. In Brussels, a top-level West German NATO employee, Rainer Rupp, himself an agent of East German intelligence, used a burst transmitter and a public payphone to reassure his handlers in East Berlin that NATO was not planning a preemptive nuclear attack. As the exercise continued, NATO commanders initiated a simulated launch of nuclear weapons. Then, nothing. The exercise ended. Warsaw Pact forces stood down. And intelligence services on all sides kept quiet about what had happened. The National Security Archive’s success in obtaining documents from American, Warsaw Pact, and some Soviet sources has not been matched in the UK. “Britain has, as it so often does, slammed the door on the release of archives,” Downing says. “No documents will be released on the subject. They are all under a minimum of 50 years classification because they relate to security.” Similarly, the KGB/FSB and military archives in Moscow are off limits to researchers and not likely to be accessible anytime soon. Downing believes it is entirely possible that Able Archer played a significant role in the end phase of the Cold War. When Reagan learned of the Soviet reaction, he was horrified. He began to soften his rhetoric almost immediately, beginning with his “Ivan and Anya” speech of January 1984. The timing was propitious. Reagan was already thinking about the 1984 reelection campaign. He had by that time established his anti-communist credentials. Now he could reach out with a new message, first with little success to Konstantin Chernenko, then to Mikhail Gorbachev, who matched his determination for change with ideas of his own, with spectacular results. Downing is not the only one to have seen the need for a steady hand on the nuclear button. In January 2017, Senator Ed Markey and Congressman Ted Lieu introduced a bill that would prevent the president from firing a nuclear weapon without a declaration of war from Congress. The World at the Brink will not be the last book on this topic. It cannot prove what Soviet leaders in Moscow said and did over those four days in November. But it does deliver the most complete story to date, and it points the way toward further investigation. The lessons of 1983 are clear. Arrogance in foreign policy increases the danger of miscalculation. Dialogue with our adversaries, whether in Pyongyang or Tehran or Moscow, is essential. Given the renewed nuclear saber rattling on the world stage, we would be wise to remember a time when a toxic cocktail of threats, fear, and misunderstanding nearly led us down the path to Armageddon.